The peaks and valleys do correspond with major events with regard to Russia. For instance, the peak in 2001 corresponded to President Bush's meeting with Putin, while the most recent dip occurred after the Russian invasion of Ukraine. These major events are shown more clearly below in a chart from FiveThirtyEight. 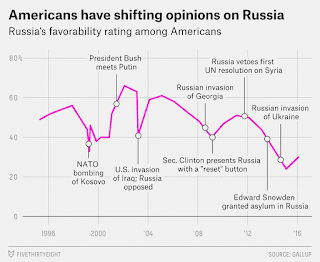 For decades, opinions about Russia haven’t varied much by party, even during the Cold War. 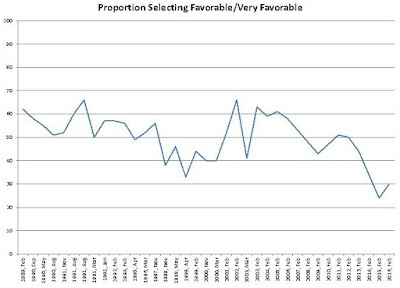 According to the General Social Survey, which tracked opinions on the Soviet Union (and, later, Russia) from 1974 to 1994, the percentage of Democrats and Republicans who gave the country a positive score was quite similar. 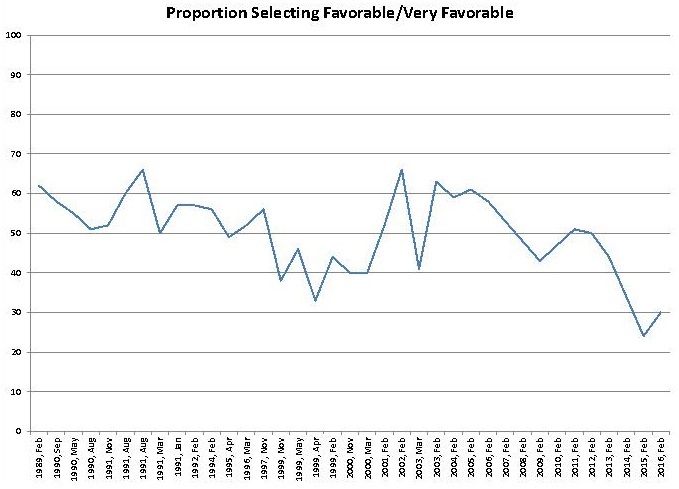 The difference between Democrats’ and Republicans’ opinion on the country was never greater than 7 percentage points, despite long Republican campaigns of anti-Communism. The same has generally been true in recent years. But the bipartisan consensus of years past may have become less stable. The CIA has accused Russia of trying to influence the 2016 election in Trump’s favor, and Trump has been dismissive of the agency’s findings. Several Democratic officials are calling for an investigation into whether Russia interfered with the election. The result, according to one survey, is one of the largest partisan gaps in opinions on Russia in the past 40 years: In a YouGov survey conducted over the weekend, 31 percent of Republicans categorized Russia as an “ally” or as “friendly” to the United States, but only 16 percent of Democrats said the same.